A deep and conscious desire creates an impression in time and space continuum, that comes to fruition at some point in your life…not the exact way you might have wished but quite close. The thought becomes the ‘Cause’ and the peculiar circumstances that coalesce to fulfil that thought becomes the ‘Effect’. This is not philosophy...but a fact of life. As a nature/landscape photographer, it is a common habit for me to browse through hundreds and thousands of pictures taken by fellow photographers from around the world…to look at the world through their eyes and lenses and derive inspiration. And every once in a while, this particular location kept popping up in the pages of 500px and Flickr and other sites…stunning seaside vista of massive eroded rock structures along the shorelines of southern Australia. The talented photographers in question, capturing dreamy dusk and nighttime shots of them…that simply blew away my mind. I wished, many many years ago…that I would one day be able to stand at those spots and witness those sights…and perhaps take a few shots of my own. Circumstances conspired and the wheels of fate were set in motion as I got a chance to visit those specific locations, albeit for a very short period of approximately 48 hours. 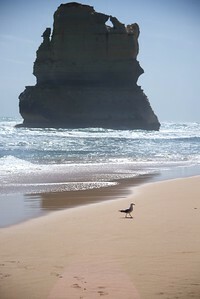 My first trip to Australia, the beautiful state of Victoria and the magnificent rock structures called the Apostles. 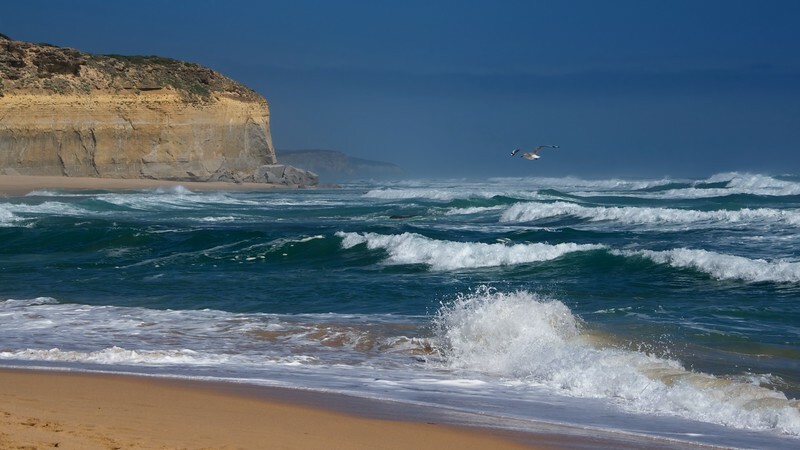 Geographically, this forms the southern coastline of the state of Victoria, along the Bass Strait (that separates Victoria from Tasmania). 48 hours is not a lot of time (in between the mandatory sleeps, food breaks and travelling to and from the airport), especially when you are going to a new country. So I began a bit of planning about a week prior…place to stay, car rental, flights and most importantly weather conditions during those two days. Over a period of one week it changed from “Partially cloudy to Rain and thunderstorms to Partially cloudy with chances of rain on 1st day and relatively clear on 2nd day”. Nature landscape photography is all about capturing the natural light and timing is critical. With the 1st day forecast of rain and dark cloudy conditions, I picked that day for some forest and waterfalls photography and the next relatively bright day for coast side photography. Waterfalls have often been my favorite subjects and they look a lot more saturated and beautiful in slightly drizzly and overcast conditions. And there’s the added incentive of being able to do little (and sometimes strenuous) hikes, to get to these falls. In terms of timing, this time of the year (the weekend before New Year’s) is certainly not ideal, from a monetary point of view. But sometimes, fate hands us opportunities on strange looking platters and we have to accept them as they come. Flew into Melbourne Tullamarine Airport on a late Friday afternoon, into somewhat overcast skies and pleasant temperatures in the mid 20’s. Tullamareena, as per wikipedia, is a historical figure…a senior man of the Wurundjeri aboriginal tribe from 1830’s. He lived near Melbourne area and resisted British occupation of his lands. He was caught, imprisoned, escaped and then recaptured and sent off to Sydney for trial. The trial didn’t go far…his complete lack of understanding of English language ensured he was eventually set free, far from his home…and that was the end of his story. The airport was nice and easily navigable, and after picking up the car and mumbling and fumbling about a bit (for about ½-1hr) getting used to driving on the left side of road (my 1st time, since learning to drive in Canada), I was off to the “Great Ocean Road (GOR)” and its two of many gems, Great Otway National Park and Port Campbell National Park. As a matter of trivia, 163 countries and territories drive on right hand side while 78 (mostly former British colonies) drive on the left side of the road. Quite a few countries across the world switched to RHT after becoming independent, including Canada which switched to RHT from LHT, to enable smooth flow of traffic at the US borders. My 2nd scenic drive was the iconic “Cabot Trail” (done at the suggestion of a colleague at the time, from Atlantic Canada, Kevin Barrett), with a friend. This 298 km loop around the northern tip of Cape Breton Highlands (province of Nova Scotia, Canada) is an absolute stunner, with a number of petite Acadian and Gaelic fishing villages along the way. 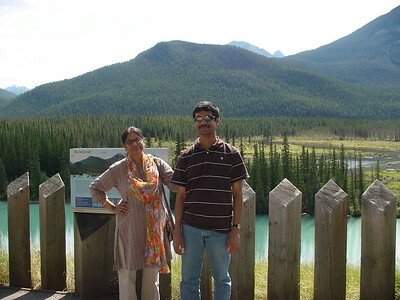 The 3rd was the “Pacific Coast Highway (PCH or Highway 1)”, California, USA. National Geographic recommends the 198 km section of this much longer road (from Monterey to Morro Bay) as a must see for anyone living on planet earth. I had one day to do this stretch, started at Monterey all right but couldn’t make it to Morro Bay, getting caught up with photography on the way, till late evening, when I had to turn back and drive to San Francisco. If you are someone who loves both, long nature drives and photography, scenic drives are perhaps the ultimate thing to do. 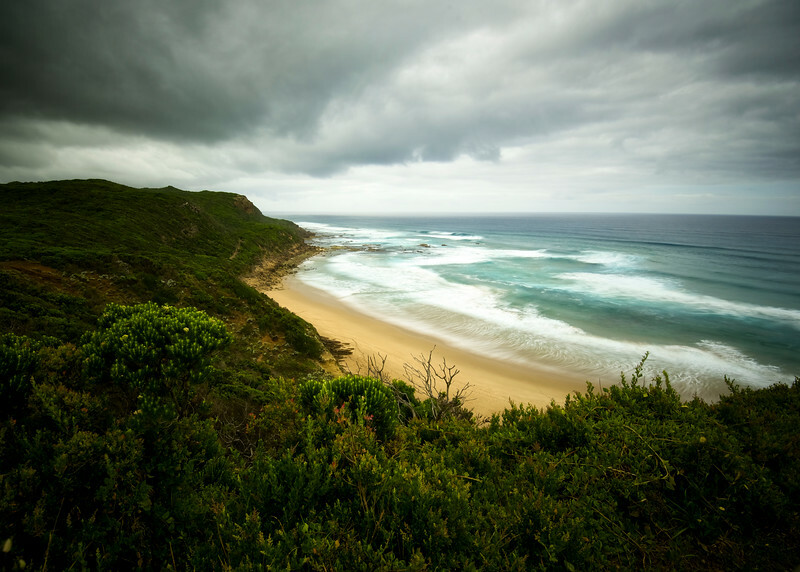 And here I was, heading out for yet another of these spectacular drives…the 243 km Great Ocean Road in Southern Victoria state, of Australia, running from Torquay to Warrnambool. After a decent night’s sleep in Belmont (Geelong), a city about 1-1/5 hrs from the two national parks, got up early next morning and left the motel around 5am, with overcast weather and a slight drizzle. Traffic at such times, especially in remote National Parks, is almost non-existent and it’s always a treat to drive in such conditions, the whole roads and parks to yourself. 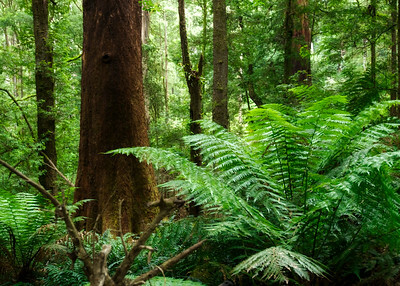 The first thing you notice as you approach the natural precincts of Great Otway NP, is the strong and distinct smell of exudations from eucalyptus trees, a sweet yet strong forest’y smell. And visually, the 1st thing about these looping forested roads in Australia that is different from similar roads in Canada and US, is the preponderance of ferns. 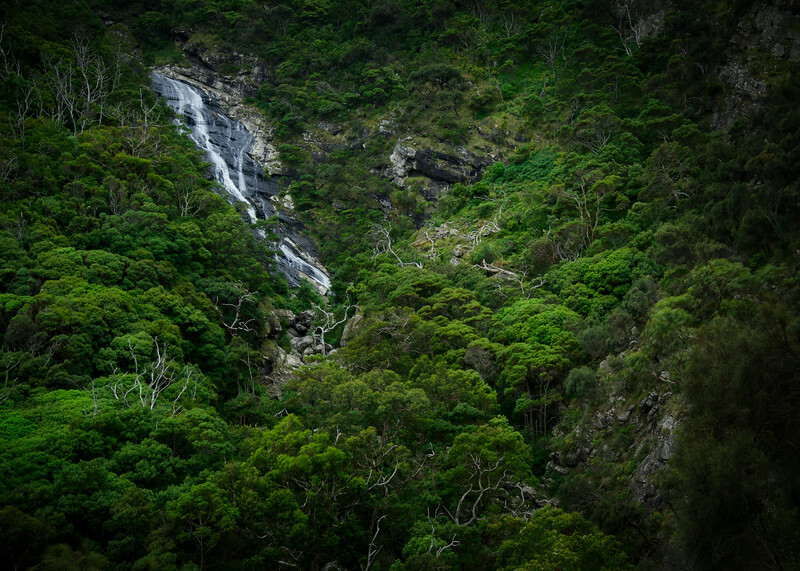 Ferns of all kinds, literally drooping unto the beautiful winding roads…as I made my way slowly in the soft morning light (the drizzle had stopped and a faint sliver of light peeked in from the sky), towards my 1st destination…Hopetoun Falls. This Falls is unarguably the most easily accessible and beautiful little falls, in the whole area. 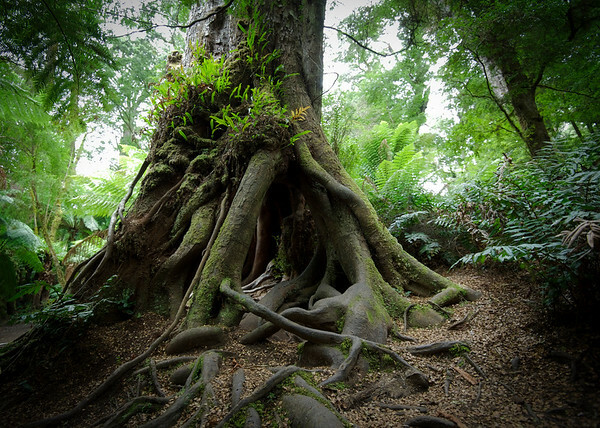 Great Otway NP is a large park (103 sq kms), stretching from the coasts, northward to Beech Forest further inland and bounded on the east and west by the small cities of Apollo Bay and Princetown, respectively. The short walk to Hopetoun Falls from the parking lot was my 1st glimpse of the almost “Avatar’ish” landscape of the whole area…the heavy ferns and moss covered ash trees drooping droplets of water on their tips…in misty surroundings! The Falls itself is a really pretty one and after spending ½ hour at the falls getting nice pics of it and just soaking in the view, I returned. At this point, will take another short diversion from the narrative…about a point (or rather an accusation) that is often made about photographers and of which I also have been accused of. That we photographers tend to lose the moment and fail to truly pause and enjoy a beautiful view, in our quest to get a good photograph. I couldn’t disagree more with this statement. In fact, I find photographers (myself included), way more sensitive and appreciative of the beauty presented to us from mother nature, than the normal visitor/tourist. And in the process of taking a photograph, we spend more time actually looking at the scene outside of the camera viewfinder, while the camera is taking its bracketed or long-exposure shots, than a non-serious photographer, who is busy taking selfies and wefies than really enjoying the view. As I made my way towards my next destination (quite spread apart across the park) -Triplet Falls, saw a sign for “California Redwoods” and decided to stop by as it was on my list to see. 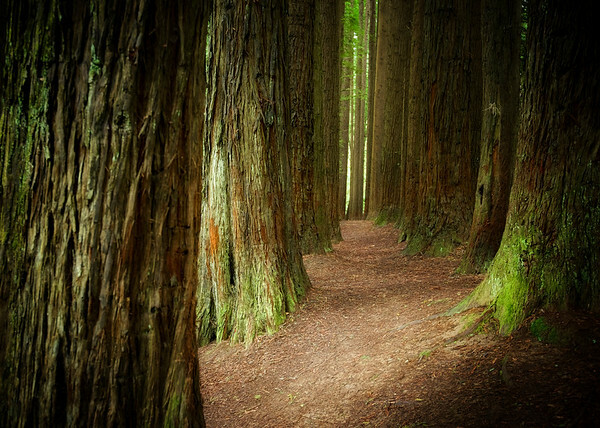 Park authorities say these Redwood trees were brought from northern California in 1930’s and planted here, forming a pretty little grove with sky high redwoods and a soft red cushion under them as forest base. The presence of a small river and ferns, accentuates the beauty of this place. After loitering about the shaded grove for some time, left for Triplet Falls, some distance away. It’s a somewhat longer hike to the falls and the last 50-100 mts to the bottom of the falls is quite steep and slippery (in light rain conditions). But that didn’t deter me from folding down my tripod and going for the climb down, holding roots of trees for support, as I slowly slid down unto the foot of the falls. And the view was totally worth it. 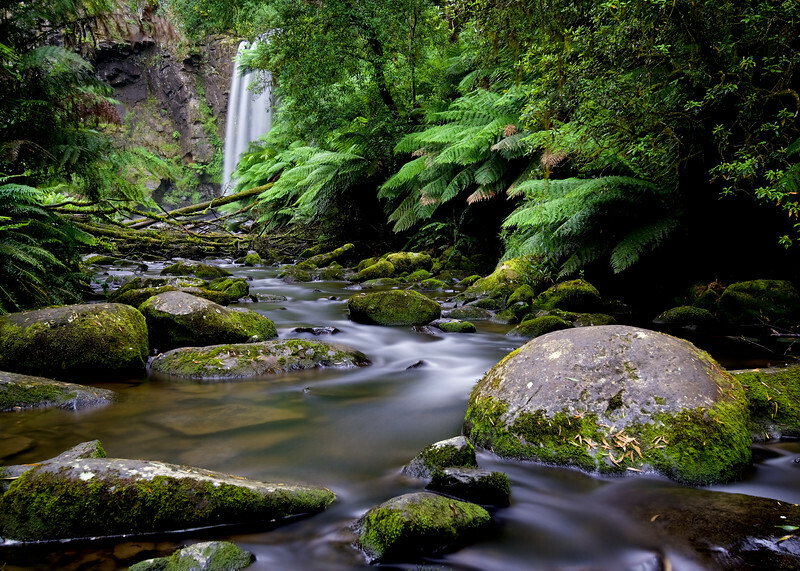 A serene waterfall with ferns and large moss-covered rocks all around, a sight probably straight out of a zen calendar. After that made a long detour to another interesting place called Red Rock Scenic lookout. 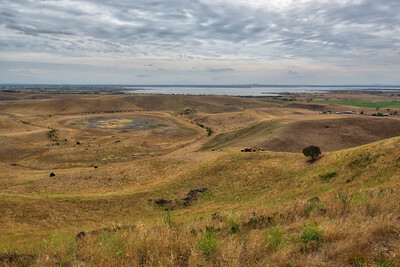 It looks out over a dormant volcanic complex unto Lake Corangamite – Australia’s largest permanent inland saline lake. Last stop was Mait’s Rest Forest walk, a deeply wooded (ash, eucalyptus, birch and others) area with a looping boardwalk taking you through this magical area. Massive ferns shooting up from the ground, forming natural arches around the boardwalk, as you stoop under them to keep walking ahead. This area and Melba Gully, are supposed to be prime glow-worm viewing areas in the park, but unfortunately, I couldn’t stay on till late night (sunsets at 9pm being bit of a problem! ), so finally made my way out of the park and to the next one, albeit for purely recon purpose, to find out good photo locations at my next day’s destination, the Port Campbell NP and the 12 Apostles. With the skies once again overcast, chances of catching a sunset were zero. As expected the 12 Apostles visitor centre was choc-a-block with weekend crowds, most probably from Melbourne and other cities nearby. Did a quick walk through the nearby lookouts before calling it a day and heading back to the motel in Belmont, with dinner at an Indian restaurant, on the way. Next day morning was pouring rain, though forecast was for clear skies by late morning. Checked out of the motel around 6am in the morning (flight back home was late in the night) and drove to my last waterfalls in the itinerary, Carisbrook Falls, a cascade high up in the hills along the GOR, surrounded by forests. The well constructed walkways from the visitor centre also lead you to another nearby site, the Gibson Steps beach, about 1.2 km from there. 89 steps from the end of the walkway, take you down to the ocean beach. At low tides (and I had gone during low tides), the two prominent rock stacks (called Gog & Magog) make for a splendid view from the beach. It was after a long time that I was walking on a sandy beach. Having tired out my legs on the previous day hikes and all day driving, now was the time to sit down a while and just enjoy the view. From there, it was a fast drive up northwest on the GOR, to see some of the most prominent structures along the spectacular coast, going up till Warrnambool. Loch Ard Gorge, a beach amid a gorge. The Arch, a tunnel like limestone structure that is in the process of turning into an arch. The London Arch, which was previously called London Bridge before being eroded into an arch (apparently the bridge collapse happened suddenly on a day in 1989, trapping 2 visitors on the outside portion, who later were rescued by helicopter). And finally the Grotto…a limestone cave and sinkhole at sea level. All breathtaking vistas and amazing works of nature.